Remember the days when you sat down with your classmates and someone would start reading. 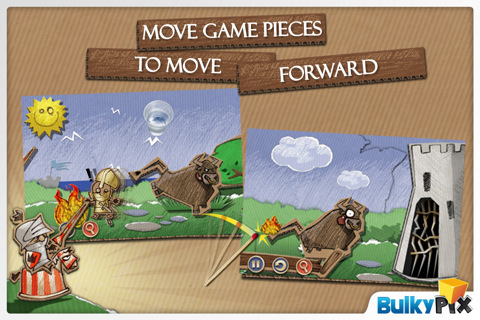 Cardboard Castle by BulkyPix is a puzzle game for the iPhone that captures that experience. 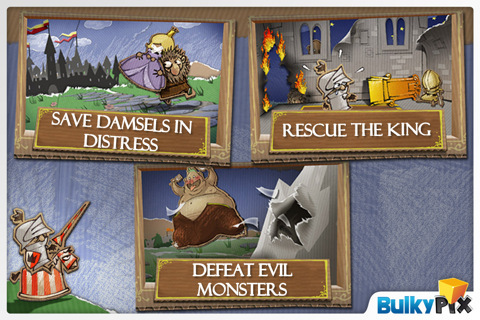 Cardboard Castle tells the story of a little less than honorable knight, who is fixing problems and saving people. You do what you can to manipulate the cardboard cutouts to complete all the puzzles within the level. The puzzles are trial and error so you just have to keep going until you find the answer. There is a training ground that teaches a few basics of the game, there are three chapters for the story which is five levels a piece, so fifteen levels in all, and finally there is a race against the clock where you must beat as many puzzles as you can. The main portion of the game is centered around the three chapters. Each chapter starts out with a little story of what is going on and what you will have to do. The knight moves as you complete a puzzle, or when you can make a bridge for him to cross. When a level begins, the screen loads up and slowly scrolls from right to left until you see the knight. You can tap the screen to speed it up. After that you tap and hold an object and see what you can do with it. When you find something you can interact with, it will have sparkles on it. Some objects like the sun can be used just as is. So for the sun, you can tap it to make it send out sun beams which will warm everything on screen or you can move it up and down to change day into night or vice-versa but only when there is a hole under the sun. The puzzles are simple at first but will make you scratch your head as the levels go on. When you beat a puzzle, the game tells you how long it took for you to beat it. If you see the message “There is nothing more you can do!” you can restart the level. At the bottom left corner of the screen, there are three icons. The first is the pause icon. It has the basic menu selections except for the skip level option. Skip level which allows you to skip one level ahead if you are stuck on a level for far too long. Another icon is the restart level icon. I used this a lot on some of the harder puzzles. Finally, there is the clue icon with two greyed out numbers. Using sovereigns (little gold coins that you collect) you can get a hint about what combination of objects could help you out. This function is sometimes useful and sometimes pointless. The music sounds like something you would hear from a Renaissance fair or a medieval movie. The sound effects which are decent include hearing the slash of an axe and rain. If the audio annoys anyone, they can choose to turn it off. The audio fits the setting of the game. Graphics are nice and crisp. The images are cardboard cutouts that can be affected by many things and sometimes in unexpected ways. You can use an axe to cut a tree, an enemy, or even yourself. There is no blood in this game so nothing gory is going to happen. Use a match to light a bull’s tail on fire so it will charge until it hits a locked gate. Use a rain cloud to drench an enemy and turn it into a wet pile of cardboard. Then use that on a pothole and use the sun to dry it up so the knight can cross it. The visuals are one of the more amusing parts to the game. You can stop anytime and play again whenever you want to. The replay value is higher in the time trial mode where you beat as many puzzles as you can (my record is twenty) although sooner or later the puzzles will repeat. Overall, I think Cardboard Castle is an amusing game for what it is. If you like trial and error type of games, funny visual effects, and something with a storybook charm, I suggest getting this app which at $0.99 is reasonably priced. AppSafari review of Cardboard Castle was written by Tony Lau on February 8th, 2011 and categorized under Adventure, App Store, Games. Page viewed 3504 times, 1 so far today. Need help on using these apps? Please read the Help Page.